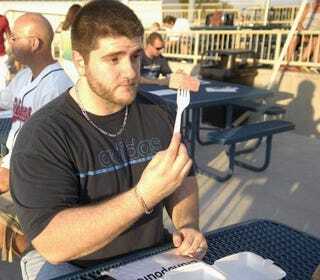 It wasn't your typical eating contest last night at Eastlake Stadium, home of the Indians' single-A club. No, it spanned nine innings, with nine different courses (that's Spam in the photo), and ended in vomit, vomit everywhere. Minor league promotions are at their best when they're a little sadistic. Take the Lake County (Ohio) Captains, and the 18 "lucky" fans who took part in the Captains Competitive Eating Olympics. 9th - One banana split. That's insidious; most eating contests are about speed, since the human stomach can pack a lot in before it tells the brain how full to bursting it is. But that much spread over three hours? Death. I assume the plan for extra innings was for contestants to scoop up vomit off the floor, and eat that. It went down to the ninth, when Mark Ogrizek won after his last remaining challenger made a break for the puke bucket. Ogrizek wins our respect, and a suite at an Indians game, where there's a complimentary buffet.